Strawberries taste best freshly picked and eaten right away while still warm from the sun. Wait until blueberries and plumbs appear to make cobblers and pies, as heat destroys their delicate perfume. Enjoy the berries whole or slice and fold into whipped cream, yogurt, and softened ice cream. A hit of acid perks the sweetness, a drizzle of lime, lemon, or balsamic vinegar; or sprinkle with a grind of pepper, a little chopped basil, is all you really need. 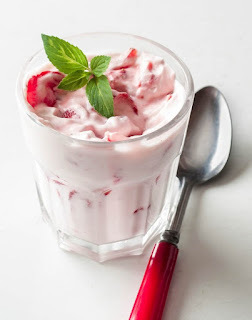 In a hurry, try this whip of yogurt and whipped cream and sliced berries, put in the freezer for a few minutes to firm and then serve semi fredo. Slice the strawberries and set aside. In a small bowl, whisk together the heavy cream until it hold stiff peaks. Fold in the yogurt and the sweeten with brown sugar to taste. Fold the sliced berries into the mix and turn into individual glasses or a large serving bowl. Put in the freezer until firm (but not hard) and serve right away. Garnish with mint.